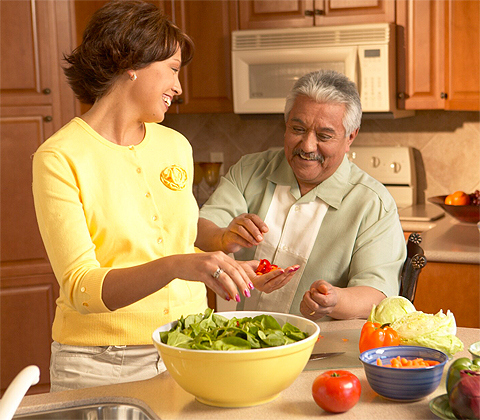 Elderly Nutrition Tip #1: Try to opt for foods with stronger flavors but avoid excessive salt. As we grow older we tend to lose approximately two thirds of our taste buds, which can in turn lead to a loss of both taste and smell. This is one of the reasons why the elderly can have a loss of appetite and might not be as enthusiastic about eating their regular meals, which can put them at risk of malnutrition. The taste buds cannot be recreated, but studies have shown that having a stronger flavor in foods, can make the meals more enjoyable again. This can be a useful way to make sure that the elderly get adequate nutrition and definitely a preferable way than seasoning the food with more than safe levels of salt to the diet. Having a more variety of textures in the meals can also make the food more appetizing. Elderly Nutrition Tip #2: The elderly and especially people dependent on wheelchair transportation should be provided with convenient and easy access to water. Seniors and wheelchair bound people are especially susceptible to dehydration which can even result in hospitalization. As people age, they lose their sense of thirst. Also, if a person is immobile or depends on non emergency medical transportation for mobility, they need to have access to water easily and not have to ask for it at all times. Elderly Nutrition Tip #3: Being on medication also has an effect of loss of appetite in the elderly. Being on a diet consisting of foods rich in nutrients can help to counter this effect. Also, a person who is not very mobile or wheelchair bound needs a balanced and nutritious diet which contains adequate calories and all the necessary nutrients. At times it may be difficult to convince the elderly or the wheelchair dependent to have large meals, so their diet should be planned such that they get the necessary nutrients and calories in the amounts that they are comfortable consuming. They can be encouraged to eat small and frequent meals which are packed with nutrients. One of the challenges in providing care for the elderly is to be able to maintain nutrition for the elderly that are experiencing confusion or forgetfulness, which in itself is a fairly common problem. Assisting the elderly or those requiring disability transportation with grocery shopping helps provide fulfilling, nutritious meals while establishing set schedules of meal times helps it become routine.